Book one in my challenge to read one book a fortnight in 2012 is Pride and Prejudice and Zombies by Jane Austen and Seth Grahame-Smith. I must confess, it’s left me feeling a bit guilty, as I’ve never read Pride and Prejudice, but since I hope to rectify that at some point this year, I don’t feel too guilty. Plus, I’ve watched many adaptations, and that has to count for something right? Pride and Prejudice and Zombies takes some of literature’s best known characters – all your favourites including Elizabeth Bennett and Darcy are here – and just adds in lots of zombies. There are still balls to go to, Jane and Bingley are still in love, and the story takes the same speed getting to its happy ending. Along the way the Bennett sisters kill lots of zombies, who have started to pop up across Britain. Pride and Prejudice and Zombies is a fun book, partly because everything is so familiar, yet so unfamiliar. When Darcy first tells Elizabeth he loves her, she doesn’t just reject him, she flings him into a mantlepiece so hard a piece breaks off (of the mantlepiece, not of Darcy). And when the stupid Lydia runs off with Wickham, the consequences are far worse for the latter than just having to marry Lydia – and far more satisfying for the reader, who has suffered the annoyance of both characters for a couple of hundred pages. Joking aside, the use of zombies can be seen to have a deeper meaning. The zombies in the book are the physically ugly manifestations of some of the characters with ugly personalities, and show how shallow and self-absorbed some of the humans are in the tale (Mr Collins is so interested in himself he fails to notice his wife turning into a zombie). The zombies’ need to feast on human flesh can be seen as a metaphor for how some characters want others simply for what is on the outside (their looks and their wealth) rather than what is on the inside. 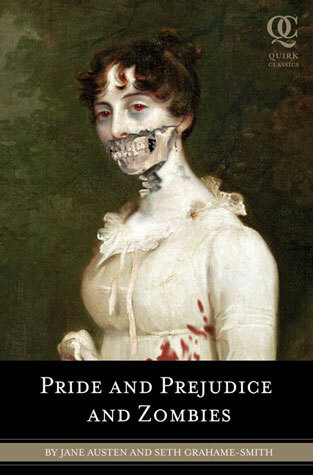 Austen purists might not love Pride and Prejudice and Zombies, but it is an amusing read and a great tribute to one of Britain’s greatest writers. Co-author Grahame-Smith clearly has a lot of respect for Austen, and he chooses to show it by turning her greatest hero and heroine into tough zombie killers.